When baby elephant Ellie can’t get to sleep one night, she turns to a wise monkey for advice. “I have just what you need,” says the monkey, handing Ellie a book. “This will work like magic.” And it does! Clutching the book, Ellie soon falls fast asleep and wakes feeling wonderful. Insomnia cured, she knows that the monkey has indeed given her a magic book. But only when Ellie loses her precious book does she discover the true secret of its magic. 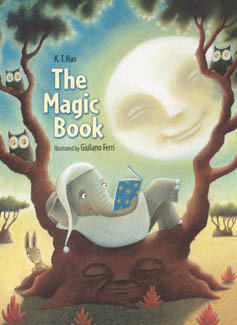 Guiliano Ferri’s beautiful illustrations perfectly complement this story about the power of books. Night had fallen and the moon shone softly in the sky. Ellie lay wide awake, staring up at the stars. She turned on her side, on her tummy and then on her back. Nothing worked. She couldn’t get to sleep. One sheep, two sheep, three sheep, four . . .
One rabbit, two rabbits, three rabbits, four . . .
Ellie tried counting chickens, then pigs, then elephants. She didn’t sleep a wink all night!